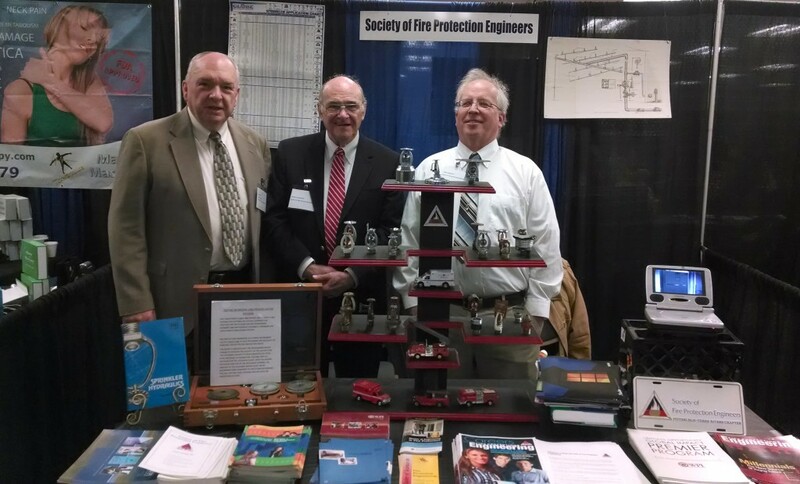 February 26th 2014 –This past weekend, Tom Taylor of our Pittsburgh Office participated in the 27th Annual Pittsburgh Fire-Rescue & EMS Exposition at the Monroeville Convention Center. He was part of The SFPE (Society of Fire Protection Engineers) Pittsburgh-Three Rivers chapter who discussed fire protection engineering careers and the educational options available. 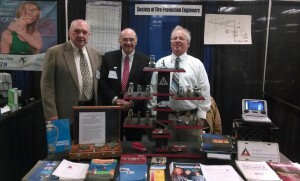 Some other chapter members who participated are Wallace “Wally” Merrell, Pittsburgh Chapter President, who is pictured (left) at the booth along with chapter members George Svaranowic (center) and Gerry Marburger (right). The two-day event provided hundreds of exhibit booths displaying all forms of available emergency service equipment, dozens of new emergency vehicles and displays of protective apparel and dress attire for first responders. Canines featured prominently in the weekend’s program with fire, arson investigation and rescue units exhibiting their dogs in training exercises. 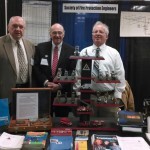 The chapter exhibit featured a tabletop display of automatic sprinkler heads ranging in age from the late 1800s to the most modern designs available. Career information brochures developed by SFPE along with educational details of undergraduate and post-graduate university-level programs offering fire engineering as a course of study were secured from the University of Maryland, Worchester Polytechnic Institute, Oklahoma State University and other schools. The target audience for this effort was young men and women fire fighters anticipating their post-secondary school educations and their wish to find educational options that build upon their dedication to fire safety and the means to channel that interest into a satisfying life-long professional career. Thousands of regional volunteer and professional fire fighters, rescue specialists and emergency medical personnel attended the two-day event. For many, it was a genuine family affair with many youngsters sporting plastic fire helmets and replicated turnout coats.